This is a scalable context timeline. It contains events related to the event January 27, 2009: Conservative Pundit Predicts Obama, Democrats Will Engineer ‘Final Solution’ of Enforced Abortions. You can narrow or broaden the context of this timeline by adjusting the zoom level. The lower the scale, the more relevant the items on average will be, while the higher the scale, the less relevant the items, on average, will be. The conservative Washington Times, a staunch opponent of President-elect Barack Obama, publishes an editorial predicting that the incoming Obama administration will, in some form or fashion, move to “exterminate” babies with disabilities and other “useless” Americans through its promised reform of the US health care system, similar to actions taken by the Nazis before World War II. The Times provides a brief synopsis of Adolf Hitler’s “T4 Aktion” program designed, in the words of the Times, “to exterminate ‘useless eaters,’ babies born with disabilities. When any baby was born in Germany, the attending nurse had to note any indication of disability and immediately notify T4 officials—a team of physicians, politicians, and military leaders. In October 1939 Hitler issued a directive allowing physicians to grant a ‘mercy death’ to ‘patients considered incurable according to the best available human judgment of their state of health.’ Thereafter, the program expanded to include older children and adults with disabilities, and anyone anywhere in the Third Reich was subject to execution who was blind, deaf, senile, retarded, or had any significant neurological condition, encephalitis, epilepsy, muscular spasticity, or paralysis. Six killing centers were eventually established, and an estimated quarter-million people with disabilities were executed.” The Times draws a parallel between the Nazis and the Obama administration’s support for legal abortion and for physician-assisted suicide, which it equates with “euthanasia.” The incoming administration will, the Times fears, begin “selecting” babies with disabilities for what apparently will be “selective abortions.” It quotes the Reverend Briane K. Turley as saying: “Were God’s design for us left unhindered, we could naturally expect to welcome 40,000 or more newborn infants with Down syndrome each year in the US. And yet we have reduced that number to just under 5,500. These data strongly indicate that, in North America, we have already discovered a new, ‘final solution’ for these unusual children and need only to adapt our public policies to, as it were, ‘cure’ all Down syndrome cases.” Turley, the Times notes, claims that “there is growing evidence suggesting that, among health care practitioners and systems, the central motivation behind legally enforced or high pressure screenings is economics.” The Times then adds: “[A]nd the results seem to bear him out. America’s T4 program—trivialization of abortion, acceptance of euthanasia, and the normalization of physician assisted suicide—is highly unlikely to be stopped at the judicial, administrative, or legislative levels anytime soon, given the Supreme Court’s current and probable future makeup during the Obama administration, the administrative predilections that are likely from that incoming administration, and the makeup of the new Congress.” The Times predicts a new “final solution” of “extermination” that will start with disabled infants and will progress “from prenatal to postnatal to child to adult.” [Washington Times, 11/23/2008] The editorial anticipates the “deather” claims that many conservatives will make in the summer of 2009 (see January 27, 2009, February 9, 2009, February 11, 2009, February 18, 2009, May 13, 2009, June 24, 2009, June 25, 2009, July 10, 2009, July 16, 2009, July 17, 2009, July 21, 2009, July 23, 2009, July 23, 2009, July 23, 2009, July 23-24, 2009, July 24, 2009, July 28, 2009, July 28, 2009, July 28, 2009, July 31, 2009 - August 12, 2009, August 6, 2009, August 7, 2009, August 10, 2009, August 10, 2009, Shortly Before August 10, 2009, August 11, 2009, August 11, 2009, August 12, 2009, August 12, 2009, and August 13, 2009). PolitiFact logo. [Source: Yahoo! Buzz]The St. Petersburg Times’s “PolitiFact” debunks the recent spate of claims by Betsy McCaughey (R-NY) that the Obama health care reform proposal would mandate ‘death counseling’ (see July 16, 2009) and encourage seniors to die sooner to save money (see November 23, 2008, January 27, 2009, February 9, 2009, February 11, 2009, February 18, 2009, May 13, 2009, June 24, 2009, June 25, 2009, July 23, 2009, and July 23-24, 2009). Days later, the Annenberg Political FactCheck organization will come to the same conclusions. Anti-health care reform proponents claim that the Democrats’ reform package will allow the government direct access to US citizens’ bank accounts. In some variants of the claim, the government will steal money from those accounts to fund the reform package. The claim is quickly disproven. From an E-mailed 'Clearinghouse of Bad Information' - Apparently the claim originates in a “chain e-mail” sent out by an anonymous anti-reformer. The e-mail, which references its claims by page numbers from HR 3200, the pending House version of the reform legislation, is characterized by the St. Petersburg Times’s “PolitiFact” team as a hugely long e-mail that they call “a clearinghouse of bad information circulating around the Web about proposed health care changes.” The e-mail is apparently based in part on the work of Peter Fleckenstein, who sends frequent and regular commentaries on Twitter under the name “Fleckman,” and posts his analyses on his blog. Fleckenstein identifies his Twitter comments with the tag #tcot, which stands for “top conservatives on Twitter.” A health care analyst with the nonpartisan Kaiser Family Foundation, Jennifer Tolbert, calls the e-mail “awful.… It’s flat-out, blatant lies. It’s unbelievable to me how they can claim to reference the legislation and then make claims that are blatantly false.” Tolbert is particularly offended by the e-mail’s claim that ordinary citizens will suffer a lack of health care in order to provide free care for illegal immigrants. Many of the e-mail’s other claims are equally wrong. Screenshot of the bottom of Recess Rally’s home page, taken August 22, 2009. [Source: Recess Rally (.com)]MSNBC host Rachel Maddow examines an organization called “Recess Rally,” which is promoting anti-health care protests over the Internet, providing information about upcoming “town hall” forums hosted by Democratic lawmakers, and proclaiming, “We the people say no to socialized health care.” Maddow gives some information on who is organizing Recess Rally. 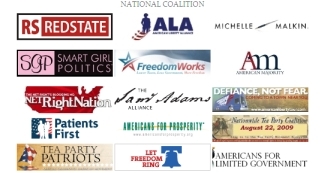 At the bottom of Recess Rally’s home page, a number of sponsors are listed, including conservative blogger and Fox News commentator Michelle Malkin, and conservative blogs such as RedState and Smart Girl Politics. Newsweek publishes an extensive article detailing what it calls “the five biggest lies in the health care debate.” Despite the title, the article actually debunks seven. The government will have electronic access to your bank accounts and steal citizens’ money (see (July 30, 2009) and After). The bill passed by the House Ways and Means Committee indeed calls for electronic fund transfers, but only from insurers to doctors and other providers. Patients are not involved in such transactions. [H]ealth-care reform will be financed through $500 billion in Medicare cuts. Again, nothing in the House bill or anything being considered in the Senate exists to back this claim. There are proposed decreases to increases in future Medicare funding, essentially reducing Medicare expenditures from the forecast of $803 billion by 2019. $560 billion would be removed from future Medicare increases over the next 10 years, and would not come from funds slated to provide actual care to seniors. And the House bill proposes increasing Medicare funding by $340 billion over the next 10 years. According to Medicare expert Tricia Newman of the Kaiser Family Foundation, the money would pay for office visits, eliminate copays and deductibles, and close the so-called “donut hole” in Medicare drug benefits. Benjamin Jealous, the president of the NAACP, addresses a church gathering where he praises the achievements of the Obama administration and decries what he says is the racism and implied violence directed against President Obama and his administration by their critics. Jealous notes “[o]ur Jewish friends sitting around saying this is too much like the period before Kristallnacht [a Nazi rampage through the Jewish communities of Germany in 1938 that helped cement Nazi control of Germany]. And old black folks sitting around going, ‘I don’t know if this is more like when my granddaddy told me about the end of Reconstruction or what I witnessed with the rise of the White Citizens Council,’” referencing the period after the Civil War and the rise of violent white supremacist groups in the 1920s and afterwards. 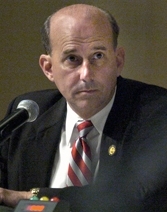 Jealous is warning of a possible violent backlash against the Obama administration’s policies, fueled by “the hatred on the radio and the hatred on the TV,” and cites instances of anti-Muslim rhetoric, incidents where Obama has been characterized as an “African witch doctor” (see July 28, 2009), and says, “Shame on you!” Blacks and others must stand together against the tide of divisiveness and violent racism, he says. 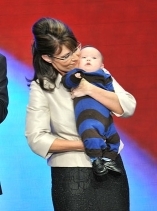 The video of Jealous’s speech is posted on The Blaze, a conservative blog hosted by Fox News’s Glenn Beck. Many of the comments accuse Jealous and other black Democrats of racism, and demand that the church in which Jealous spoke have its tax-exempt status revoked. [The Blaze, 9/27/2010] Conservatives are quick to lambast Jealous for what they call his “Nazi references.” Beck plays a clip from Jealous’s speech on his September 27 radio show and says: “So he’s talking about that there are people who want to purge people—that the Jews are saying, ‘Oh, I don’t know what’s happening, I guess with the tea parties—is too much like Kristallnacht.’ Who’s calling whom Hitler?” [Media Matters, 9/28/2010] Influential conservative blogger Jim Hoft calls Jealous’s speech “sick” and “hate-filled,” and falsely tells his readers that the Nazis were a “socialist” organization. [Gateway Pundit, 9/27/2010] Another influential conservative blogger who posts under the moniker “Allahpundit” writes: “Isn’t this the same Benjamin Jealous who spent a week in July appearing on any chat show that would have him in order to lament the destructive impact of incendiary rhetoric by some tea partiers? And now he’s playing with… Kristallnacht analogies?” [Hot Air, 9/27/2010] The commentators are ignoring a long tradition among some conservatives of labeling political enemies, frequently Obama, as “Nazis” (see November 9-10, 1988, February 15, 2001, March 30, 2001, October 1, 2002, August 8, 2006, February 2007, May 21, 2007, March 13, 2008, July 2008, October 25, 2008, November 11, 2008, November 23, 2008, January 2009 and After, January 27, 2009, February 11, 2009, March 4-6, 2009, May 13, 2009, June 9, 2009, July 17, 2009, July 24, 2009, July 25, 2009, July 28, 2009, August 1, 2009, August 4, 2009, August 6, 2009, August 6, 2009, August 7, 2009, August 8, 2009, August 11, 2009, August 11, 2009, August 11, 2009, August 11, 2009, August 13, 2009, August 18, 2009, September 29, 2009, September 2, 2009, November 3, 2009, November 5, 2009, April 22, 2010, May 19, 2010, May 25, 2010, July 26, 2010, August 16, 2010, September 17, 2010, and October 3, 2010).